There are many ab exercises that really work your obliques. 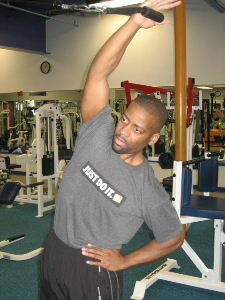 If you want to really work your obliques you must do side bending or rotational movements and exercises. The obliques work really well during straight forward movements like crunches and sit ups, but the obliques are emphasized when your body bends to the side or twists. 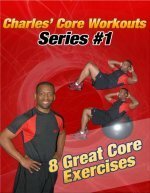 Below are pictures of a unique ab exercise that will really work your obliques. Starting Position: Attach a handle to the top part of a cable machine. Grasp the handle with your hand and stand far enough away from the cable machine to allow your body to bend slightly towards the weight stack. Form: Exhale and while keeping your arm straight, bend your body away from the cable machine. Hold for a brief second and then return to the starting position. Personal Trainer Tips: This can be a tricky exercise to master. You have to do your best to use your waist and not your arms to pull the weight. 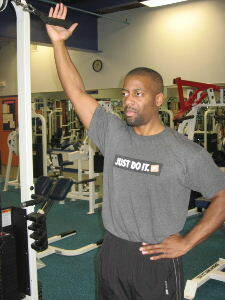 You will feel some muscle work in the arm, but try to keep the shoulder stable while moving from the waist. Move in a slow and controlled manner, and always listen to your body and build up slowly when trying new exercises. There are additional versions of this exercise. You can do side bends with the 1 arm that is farther away from the resistance or you can do side bends with both hands overhead. Oblique exercises also tend to work the lower back muscles. And you may feel some muscle work in the lower back also. Make sure you do some hip stretches and lower back stretches after a tough oblique workout. If you don't have access to a cable machine, no problems. Visit the page on oblique exercises to learn more ab exercises that really work your obliques, and remember to listen to your body and have fun working out.